Check back here for the latest news and information from Ohio Reproductive Medicine. 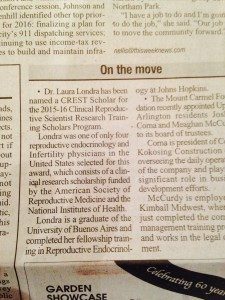 The Columbus Dispatch local publication “This Week” names Dr. Laura Londra as a person “On the move” for her recent CREST scholarship award. Funded by American Society of Reproductive Medicine (ASRM) and the National Institute of Health (NIH) the award is for physicians who shown promise in reproductive medicine clinical research activities. Dr. Londra’s research has been published in multiple journals including the official journal of the American Society of Reproductive Medicine, Fertility and Sterility. Her most recent publication had the honor of being selected for discussion by a worldwide audience of more than 500 fertility specialists during the online live Fertility and Sterility Journal Club. _______________________________________________________________________________________________________________________________________Dr. Chad I. Friedman voted Best Doctor in the speciality of Obstetrics & Gynecology in Columbus Monthly’s 2014 Best Doctors list for Central Ohio. Congrats to Dr. Friedman as his peers have voted him as Best Doctor in the specialty of Obstetrics & Gynecology! The upcoming December issue of Columbus Monthly will publish the results of the 2014 Best Doctors list for Central Ohio. The December issue of Columbus Monthly will present Best Doctors: The List in conjunction with the Columbus Medical Guide (produced in cooperation with the Columbus Medical Association), combining one great medical and health care related package. ORM renews participation in the Optum Centers of Excellence (COE) network for Infertility. Click here to view a pdf of the congratulatory letter. ORM was recognized for its continued commitment to standards of excellence in treating patients who require care for complex conditions. Click here to view the congratulatory letter and certificate. ORM’s Dr. Elizabeth Kennard and Dr. Grant Schmidt provide observations regarding current trends in infertility coverage. Suzanne Hoholik reported on Sunday, August 29, 2010. Click here to read the official Columbus Dispatch News article. In a survey where 221 responses were received back from licensed physicians in a seven-county metro area, of the doctors who responded, their top choice for infertility was ORM’s Dr. Steven Williams, 10TV’s Andrea Cambern reported on Thursday, July 22, 2010. Click here to read the official 10TV News article and see the video. Dr. Elizabeth Kennard made the cover of Columbus CEO Magazine and is featured in an article. A graduate of the Case Western Reserve University School of Medicine, Kennard, 49, found her calling in reproductvie medicine, assisting families facing infertility issues. She came to the field while in her obstetrics and gynecology residency. Stacked on a coffee table in Dr. Elizabeth Kennard’s office are photo albums (. . .) The families depicated are no relation to Kennard, but she has had a hand in the formation of each. Click here to visit Columbus C.E.O. Magazine’s website. Dr. Elizbeth Kennard discusses the secure process of egg storage and retrieval at ORM’s facilities on WBNS-TV10 News, at 5 PM in Columbus, Ohio. This interview was sparked by the recent discussion of an imporperly implanted egg in an Ohio woman by a facility not in Ohio. Dr. Elizabeth Kennard has co-authored the Feature Article in the Journal of Reproductive Medicine® (Volume 54, July 2009, Number 7), titled “The Use of Nonmedical Treatments by Infertility Patients. Click to follow a link to the article. Dr. Friedman discusses the ORM Egg Donor program at ORM on WBNS-TV10 News, at 6 PM in Columbus, Ohio. Dr. Elizabeth Kennard discusses PGD as it relates to “Designer Babies” with Columbus, Ohio Channel nbc4. Dr. Grant Schmidt is interviewd by the Columbus Dispatch’s Suzanne Hoholick and discusses the ethics of implanting multiple embryos. “We work really hard to minimize multiples,” said Dr. Grant Schmidt, a reproductive endocrinologist at Ohio Reproductive Medicine. Dr. Williams discusses the octuplet birth and ethics, IVF procedures offered at ORM on Good Day Columbus WTTE-TV28, 7AM News in Columbus, Ohio. Nadya Suleman with the OSU Lantern’s Heather Hope. Columbus C.E.O Magazine’s Amy Aldridge interviews Dr’s. Schmidt, Kennard and Williams for an article concerning “The Economics of Infertility”. Dr. Chad Friedman provides comment in an article featured in Columbus Parent Magazine. Click above to view the article on their website.